Equip: Improves critical strike rating by 112. Gahz'rilla is already a NPC, so I would presume some relation here. What we do know is that at the minute this is a hydra. ED-Considering this is before any of this information is released, you can't exactly downrate this. 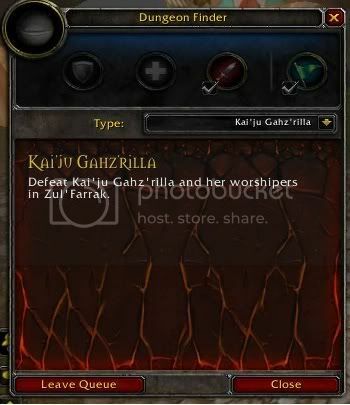 Something to note: Kai'ju is Japanese for Monster. It's actaully a term of endearment from older siblings to younger siblings. Hydromancer Kulratha: "Soon, the rifts will be large enough for Gahz'rilla to assault the heathens' cities directly. She will reduce them to frozen rubble!" Also, she has babies, and this. So, maybe this is a whole new hydra, that happens to be female (we did, after all, kill the old one). Or maybe Blizzard made a mistake. Anyways, where the old Gahz'rilla is clearly defined as male, this one is clearly defined as female. Helpless people on the tram scream for God as he looks in on them. Why did they pick him to represent Water Elementals. After defeating the elementals in Orgrimmar the Theradras and Flamelash fights are unlocked in random dungeon finder. Sarsaun Kai'Ju are unlocked after defending Thunder Bluff. The boss battles are pretty simple. Kill the adds don't stand in the things they throw. Every boss has a special ability that can be very annoying. Sarsaun has an AoE stun, Kai'Ju an ability similar to Ice Block. He has 1.5M hp so you will want to have a lot of dps. he casts an attack similar to a dragon breath so if you are a tank you should probably turn him away from the raid. sometimes he iceblocks his main target and doing so he is unable to attack, make sure that you dont get aggro from him if you are dps as tank will not be able to taunt. When he is low on HP he will iceblock himself and return back two 1.0M hp. he uses this ability only once. Sometimes he creates ice pillars that throw people in the air if not avoided. Freeze Solid - Iceblocks a party member, it is both interruptible and dispellable. Icicle Breath - Ice breath on tank, face away from party. The debuff slows and is dispellable. Gahz'rilla Slam - Throws people in the air, strafe to avoid or kill the spawns and play in the kiddy pool. Gahz'rilla Glacier - Ice blocks himself once and returns to full health, interuptible. Water They Up To? - Turn in to General Marcus Jonathan at 69.6, 82.2 or Hamuul Runetotem in Thunder Bluff. Gotten inside of the instance. Modeled after Gahz'rilla from Zul'Furrak. Everyone can avoid the freezing breath, including the tank if he strafes around to the side or rear when the boss starts to cast it (ala Pound in AN). You can interrupt the casting of his shield too, so if you don't want him Ice Blocking himself and healing up to 75%, interrupt it. Apart from that, move out of the Ice on the floor, or you'll get punted into the air (seemed to be reducing my threat too). There are mean fish in the water. Don't be the dumb one like me. If you have a duh moment, there are stairs by the boss. Gahz'rilla Glacier can and should be interrupted. Remember Ahune? There's a short animation before the Ice Spikes shoot a player up into the air. It can be avoided if you move immediately. So, anyone consider this a big battel? You can prevent Gahz'rilla's heal by interrupting "Glacial Shield." He casts it around 25% HP. I'd say it's not even close to hard. On par with Princess. Ambassador Flamelash is the most annoying one. As mentioned in the quest Gahz'rilla, this 'gal' is a gent. As a death knight tank, you can avoid the first with Anti-Magic Shield. and for the third, Anti-Magic Shield should be available again. The fourth you'll either have to avoid by strafing (I'm not sure how reliable this is) but this should give you enough of a threat lead to last during the stun. This prehistoric b**** puts itself on ice. I'm pretty sure the island in "Lost" was actually that island off the coast of Feralas. Yeah I thought so, as a friend of mine told me it's like Pound. But you will have a hard time, running into the boss to avoid this. For Anub'arak it's always sufficient for me to run directly into the mob when he begins to cast. But I feel with the mostly-permanent slowng debuff (due to Icicle Breath) from Kai'ju Gahz'rilla, I have never managed to run fast enought into the mob to avoid the damage and more important the stun. All the bosses in one vid. What are the drop rates for his drops? ATM I'm not seeing them. Didn't I kill him when I was nothing but an up and coming hero? Why am I killing him again? DOES NOTHING EVER DIE IN AZEROTH! ITS MERELY A SET BACK! For me, It seems rather impossible as a tank to avoid the throw up into the air. And before posting weird stuff, it's a Kaiju ability, not the ice spikes. Whenever he casts that (insta) i lose all mah agro. Anyone have an idea on how to handle it? All i do atm is getting whacked and then taunt mid-air. Seems to work but it's still annoying. ps; Did this on the pala, DK already haz better gear. Are the Gahz'rilla Spawn tameable? Drop rates don't seem accurate. Killed him at least 15-20 times and not one ring of any type.